For the serious turkey and deer hunter. Universal fit for ventilated rib shotguns. Rifle-style full elevation/windage adjustment. Includes two interchangeable rear sights. All-metal construction. Full windage and elevation adjustment. Front diameter is .060″; rear diameter is .029″. 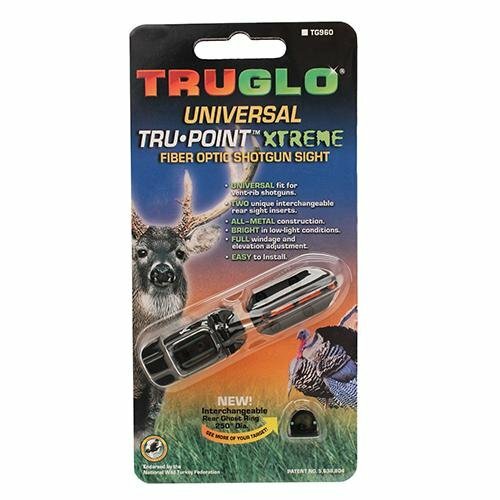 The TRUGLO Tru-Aspect Xtreme Deer/Turkey Common shotgun sight is for the intense turkey and deer hunter. Common are compatible for ventilated rib shotguns. Rifle-taste Complete elevation/windage adjustment. Comprises interchangeable rear points of interest. All-steel building. Complete windage and elevation adjustment. Entrance diameter is .060″; rear diameter is .029″. Recommended through the Nationwide Wild Turkey Federation. For the intense turkey and deer hunter. Common are compatible for ventilated rib shotguns. Rifle-taste Complete elevation/windage adjustment. Comprises interchangeable rear points of interest. All-steel building. Complete windage and elevation adjustment. Entrance diameter is .060″; rear diameter is .029″. Recommended through the Nationwide Wild Turkey Federation.